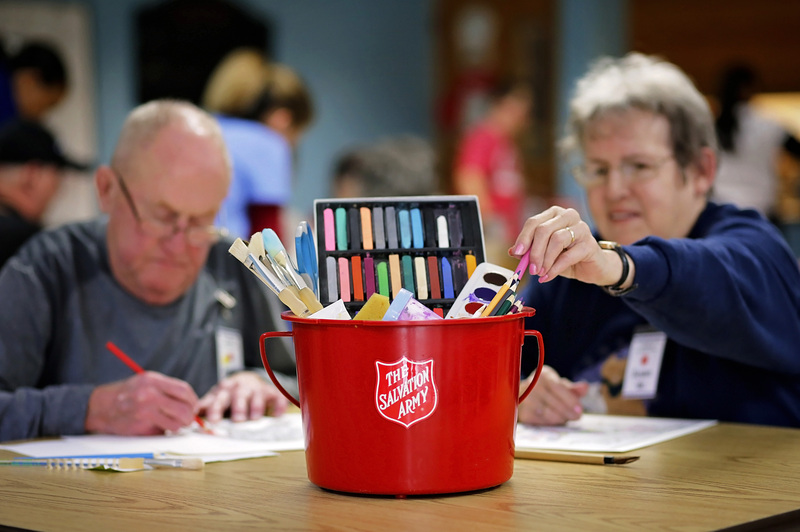 The Salvation Army's Golden Age Center provides numerous opportunities for older persons, allowing them to stay active, engaged and involved. This center is open to individuals over 50 years of age, from all walks of life. It serves breakfast and hot lunches daily and offers a variety of activities each week. Instructional classes, computer classes, social service referrals, shopping, and overnight trips are but a few of the benefits of membership. As an Erie County Nutrition Site, the center ensures that seniors of all income levels have access to a nutritious meal, which provides 50% of the recommended daily nutrition allowances at little or no cost. Lunch is served from 12:00pm - 1:00pm, Monday - Wednesday. The Center is easily accessible. Located on major bus routes and across the street from the Allen-Hospital Metro Station and with free parking for those with vehicles. Art classes are offered every Tuesday. Beginner and experienced artists create oil paintings, sketches, portraits, images and landscapes. Free computer training is offered Monday - Friday, from 10am - 2:00pm, with instruction on Internet; Email; Computer Hardware; Windows; Microsoft Word; Microsoft Excel; Microsoft PowerPoint and Microsoft Access. The center also offers classes in Music, Exercise, and Senior Nutrition. Recreational activities, such as billiards, knitting, bingo, weekly book club meetings, and stretch band exercises are available at the center as well. Religious & Spiritual Classes are held weekly. For those who might otherwise be alone on the holidays, dinner is served at noon on Thanksgiving Day and Christmas Day.